In the middle of my 2nd year of studies for a joint degree in Political Science and Middle Eastern History, I decided that Pol-Sci was not my cup of tea, and moved to studying Middle Eastern History full-time. One of my first memories after that move was a reading assignment given by a professor I particularly admire – to read a few chapters of a book by an author then unfamiliar to me, Amin Maalouf. The book was titled In the Name of Identity: Violence and the Need to Belong. Having only been recently introduced to Edward Said’s critique of “Orientalism”, I instinctively cringed a bit at the title. Was this going to be a book which explains violence in my region as somewhat inherent to the identities of its peoples? Am I going to be force-fed with essentialist rubbish so soon? But no sooner had I begun reading the allotted chapters from the book, than I was entirely entranced. Maalouf seemed to be writing truths which I could have never articulated in such a fashion. In fact he seemed to be writing things that had never crossed my mind before but that upon reading, seemed to resonate so immediately and so deeply that they haven’t let go of me since. All fears of an “Orientalist” product were washed away, and in their place, a sense of awe settled in. Maalouf’s basic premise, in my own words of course, is this – the world over, but in the Middle East & North Africa in particular, there are individuals and groups who live “on the seams” of societies and identities. Their histories, their life choices, their trajectories, all make them belong and identify with more than one coherent group, which in turns renders them suspect and at the risk of belonging to none at all. Striving for an identity is according to Maalouf a central driving force for individuals and groups in our region, and the direction in which it drives us is more often than not one of two polar opposites – destructive or constructive. Many at the seams may choose to deny their internal complexity – to fight against it – so they can clearly belong somewhere in place of nowhere at all. This is a struggle within oneself, which in volatile conditions, can often lead to choosing violence as a tool in the war on identity. The alternative Maalouf offers for people who are “composites” of different identities, like himself, is to make use of their internal complexity in order to become bridges between those warring identifications – to accept their own composite nature lovingly, despite all its tensions and ramifications, and to actively become living bridges between those seemingly disparate identities. There I was, a 2nd year history student born and raised in Israel, who came back from what I thought was my calling, studying music and sound in the United Kingdom, because I had felt an intense, at times unbearable, longing for home. But the “home” I longed for didn’t end at the “green-line”, it extended way beyond it: to the Arabic language and music I had only seldom heard before, to the peoples around me with whom I had never a chance to speak, to lands I’d never seen and voices I’d never heard. It was uncanny. Living in Liverpool for a year, I had found myself strolling purposely into chiefly Arab neighborhoods, because there I did feel home. And reading Amin Maalouf’s book made it all make sense. I think that in many ways, what YaLa is doing is creating a hub for those people of whom Maalouf wrote – people who live and feel at the seams of two, or more, different and conflicting identities. But instead of fighting with ourselves, we choose to embrace that feeling of belonging in more than one place, and to use it as a tool – political, social, cultural – and to show that there is another way. When I felt that intense sense of sympathizing with Maalouf’s words in my 2nd year at University, I had no idea that something like YaLa was even an idea. But now I feel that through YaLa, there are many people across the Middle East & North Africa who are fighting to create, not destroy, in the name of identity, every single day. This is the hardest fight – because it leaves you with little comfort and no solid “place” to retreat to when you’re exhausted. But it is also the only fight which brings with it promise for the future – because it necessarily means that you are fighting alongside others vastly different from you, for all our futures, which can only happen alongside – and never at the expense of one another. 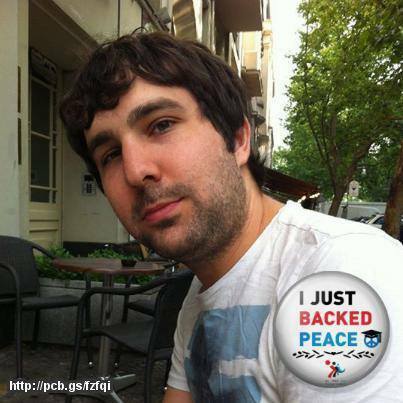 Posted on March 14, 2013 April 10, 2016 by rebeccabrindzaPosted in English, UncategorizedTagged israel, NimrodBenZeev, peace, peace activism, yalayoungleaders.